The following advice should help you understand how you can reduce or avoid most baggage fees, or how to reduce them if you have to check bags. Most airlines let you travel with a carry-on bag, as well as one smaller personal item such as a purse or backpack, without charge. The carry-on bag must be within certain size and weight limits. 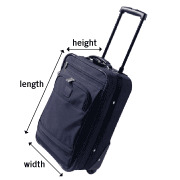 For US carriers, the typical size limits for carry-on bags are that the sum of the height, length, and width of the bag should be less than 45 linear inches (114 cm), and the weight under 40 pounds (18.2 kilos). The most common type of carry-on bag has a height of 9 inches (23 cm), a length of 22 inches (56 cm), and a width of 14 inches (35 cm). Personal items must be small enough to fit under the seat, and for most aircraft that means it has to be much smaller than a carry-on, with a typical limit being 36 linear inches. The shape of the space under the seat may vary by aircraft, so it may be best to use something that does not have rigid sides, like a purse or backpack, so it can more easily fit into an oddly shaped space. You may want to review AirSafe.com's baggage resources for limits on what you can pack in your checked bags, and what you can pack in your carry-on. While a few airlines still allow you to check one bag for free, most charge you for the first checked bag, just about all of them charge higher fees for each additional bag. Most airlines have limits on the maximum size and weight of checked bags, and may not even allow you to check oversized or overweight items. The typical limit will be on the size of the bag (specifically the longest dimension of the bag), and on the weight. Bags that exceed these limits may face additional fees or may not be allowed on the aircraft at all. Check with your airline for details. Carry-on and checked luggage size and weight rules may vary by airline or by flight, so you may want to check with your airline before you fly. Typically, international flights have different rules from domestic flights, so if the first leg of your trip is a domestic flight, but your destination is overseas, then the international baggage fee rules may apply. A lso, your airline may have different rules for different aircraft types, and you may be forced to check a standard sized carry-on, and may even be charged by your airline. When you search for flights, you should also check the baggage rules for the airline, especially if it is the first time you have used this airline, or if you are doing something associated with higher fees such as international travel, travel with several checked bags, or travel with oversized or unusual items. Depending your airline or your circumstances, you may not be charged baggage fees. Often, if you are a premium member or your airline's frequent flyer program, you may be able to check one or more bags for free. Also, for US airlines, active duty military personnel or their family members traveling on official orders may be able to check bags for free in some circumstances. When you travel in a group of two or more people, each ticketed passenger has the same free baggage allowance. For example, if you are flying with a child, that child would typically also be able to have a free carry-on bag and personal item. Many airlines will not charge fees for certain carry-on or checked items. Examples include medical equipment such as crutches, canes, and portable oxygen concentrators, as well as infant car seats, and strollers. Baggage fee rules may be different for the outbound and return portions of your trip. For example, for an international flight, the fee rules for someone leaving the country may be different for a passenger returning back to that same country. While your bag fees will likely be the same if you are taking a domestic round trip with the same airline, that may not be the case if you purchased a ticket that involves different airlines for different parts of the trip. If in spite of your best efforts, you get to the airport and find that you have to pay a baggage fee, be prepared to do so. If you think that you were wrongly charged, make sure you keep all your documentation, including any receipts, and ask for a refund at a later time. If you think you were wrongly charged and don't get a refund, you may have to complain to the airline to get your money back.